Ethiopian Airlines (addis Ababa) has announced that it will launch direct thrice-weekly service to Geneva, Switzerland on June 3, 2018. The route will be operated with Boeing 787-8 Dreamliners. 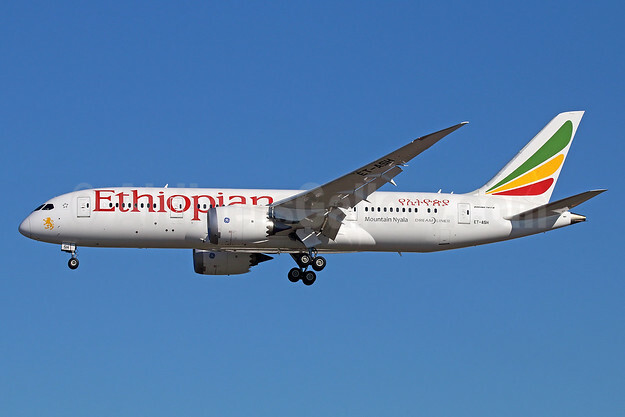 Ethiopian’s fleet includes ultra-modern and environmentally friendly aircraft such as Airbus A350-900, Boeing 787-8, Boeing 787-9, Boeing 777-300ER, Boeing 777-200LR, Boeing 777-200 Freighter, Bombardier Q-400 double cabin with an average fleet age of five years. In fact, Ethiopian is the first airline in Africa to own and operate these aircraft. Ethiopian is currently implementing a 15-year strategic plan called Vision 2025 that will see it become the leading aviation group in Africa with seven business centers: Ethiopian Express & Ancillary Services; Ethiopian International Services; Ethiopian Cargo Services; Ethiopian MRO Services; Ethiopian Aviation Academy; ET In-flight Catering; and Ethiopian Ground Services. Ethiopian is a multi-award winning airline registering an average growth of 25% in the past seven years. Copyright Photo: Ethiopian Airlines Boeing 787-8 Dreamliner ET-ASH (msn 38754) LAX (Michael B. Ing). Image: 930558. This entry was posted in Ethiopian Airlines and tagged Boeing 787-8 Dreamliner, ET-ASH, Ethiopian Airlines, LAX, msn 38754 on January 10, 2018 by Bruce Drum.